We haven’t purchased a single egg since moving out here in 2002. Chickens were the first animals we brought to our homestead. In fact, we bought our first 25 chicks and began raising them in our basement in the Chicago suburbs one month before we moved to our farm. After much deliberation, we bought buff Orpingtons and silver-laced Wyandottes. They turned out to be wonderful layers, but we were also seduced by many other beautifully feathered birds. Since then, we have had many different breeds, including a few bantams. 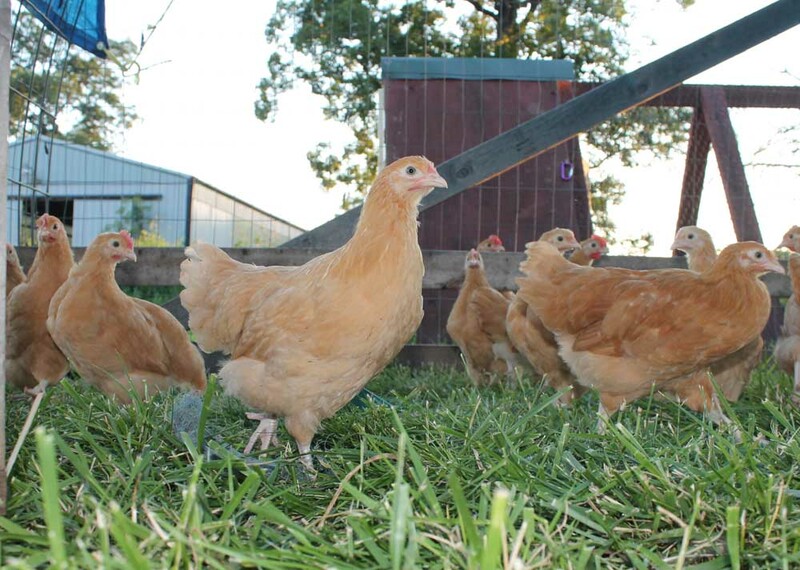 Our “big” chickens have included golden-laced Wyandottes, barred Plymouth rocks, white Plymouth rocks, light brahmas, buff brahmas, speckled Sussex, black australorps, salmon faverolles, Delawares, Easter eggers, New Hampshires, and Rhode Island reds. Since 2012, we have also kept a small flock of silver sebrights, which are an English bantam breed that has no standard sized counterpart. 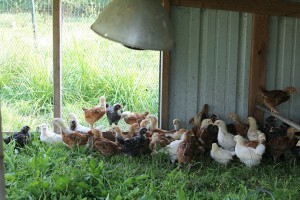 Our current laying hens are barred Plymouth Rocks, New Hampshire reds, and Delaware. How do we raise our chickens? We start with old-fashioned, natural breeds of chicks and provide them with antibiotic-free, natural grain. 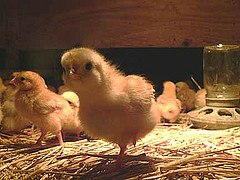 If they’ve been hatched in an incubator, they need to stay under a heat lamp for several weeks to stay warm. At three to six weeks of age, depending upon weather conditions, the chicks are moved outside to enjoy the grass and sunshine. This is not the cheapest way to raise chickens, but it is the healthiest for the birds, the consumers and the environment. We keep the hens as layers, and the roosters are processed between three and five months of age. What’s the difference between a supermarket chicken and a heritage chicken? Chickens in the supermarket today are all the exact same mutant breed of chicken. They range in age from four weeks for what they call a Cornish game hen up to 10 or 12 weeks for what they call a roasting chicken. They’ve merely used the labels of yesteryear to describe the different sizes of today’s chickens. 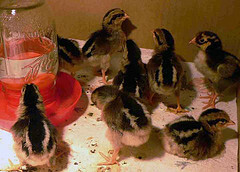 Yes, I’m saying that Cornish game hens are not really Cornish game hens – they’re baby chickens. Cornish game chickens are not raised commercially in this country any longer. The modern supermarket chicken has white feathers, and it was developed in the 1980s for an ability to grow extremely fast on the least amount of feed. Some grow so fast that they die of a heart attack before they’re big enough to butcher. In fact, the hatcheries advise farmers to allow the birds access to feed only 12 hours out of every 24 hours, so that they don’t grow too fast. Why do they have white feathers? Because that provides the “prettiest” carcass. Chickens with dark feathers may have a few black spots where the pin feathers broke off under the skin. This can happen with the supermarket chicken too, but the consumer doesn’t see the white pin feathers. 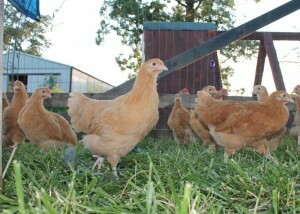 A heritage chicken is one of the many different breeds of chicken that was historically raised on farms across America. Breeds were chosen for their ability to thrive in particular climates and to evade predators. Historically, white chickens were not favored because their color made them easy for predators to spot — no camouflage! Chickens with flat combs were favored up north so that the comb wouldn’t freeze off in winter, and chickens who could stand the heat were favorites down south. The best layers were not very popular because they were scrawny meat birds, and the best meat birds were not favored because they were terrible layers. Instead, the most popular heritage chickens were dual-purpose — those that could provide a good chicken dinner and a great breakfast of scrambled eggs. The natural cycle went something like this — a hen sets on her eggs and hatches six to eight chicks, half of which are roosters. Predators might get the slowest one or two as they grow up, but in three or four months, some roosters were butchered for fried chicken. One or two might be kept for a couple extra months and butchered as a roaster. The hens were not butchered because they were the replacement layers for the hens that were getting older. Once the hens were a few years old and no longer laying much, they would be butchered for stewing. While most modern consumers cringe at the thought of eating “an old chicken,” our grandmothers knew that these chickens provided the most flavor and the best broth. They are perfect for chicken and dumplings or chicken soup. They can also be cooked in water, over a low heat, and then the chicken can be pulled off the bone for use in casseroles or salads. 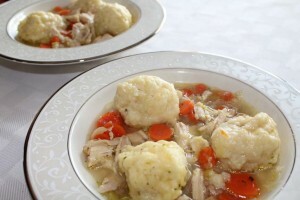 The broth can be used for any recipe that calls for chicken broth. PLEASE NOTE: We do not ship live chickens.